I perform all of my liposuction procedures using the tumescent technique. The tumescent fluid acts to numb the area. After the area is numbed, the fat is removed with an instrument called a cannula. The cannula size plays an important role in the final surgical result! Small thin cannulas give smooth even results. There are many types of liposuction techniques, but I only perform tumescent liposuction because it has a great track record. It is the gold standard for liposuction. From small finesse areas to multiple area liposuction it beats Smart lipo, Vaser, and Lipodissolve –hands down, no questions. The term ‘tumescent’ refers to the fluid used to numb the area. It is injected into the area before the extraction of the fat begins. This fluid solution makes it easier to remove the fat with a cannula. The tumescent solution acts to numb the area and reduces the amount of blood loss during the procedure. The goal is to have the least amount of blood loss during the Liposuction procedure, so the function of the tumescent solution is very important to safety. For the extraction of the fat, it is the cannula which removes the fat. Vaser, Smart Lipo, and Lipodissolve all are having growing pains related to figuring out the best range for their respective modalities. Lipodissolve is what I would call a beta technology. Smart Lipo is 1st generation technology. Vaser is 2nd generation technology, but for some reason it’s not catching on. Tumescent Liposuction, however, is mature technology, and better yet, still innovating. Cannula choice plays an important role in Tumescent Liposuction. The cannula is the instrument that the surgeon uses as his tool to extract the fat. Fortunately, there have been many refinements of cannula design. For example, a few years ago the standard for body contouring was using larger cannulas (4 and 5 mm) for the deep layers , and 3mm cannulas for the superficial layers. Nowadays I use exclusively 3 mm cannulas. Why? The result is much smoother. There is less bruising, less pain. Lets examine the different size cannula choices. If you look at the upper two cannulas in the photo above (4mm and 5mm cannulas), they have large holes. They make the fat extraction easy and fast, but at a price. 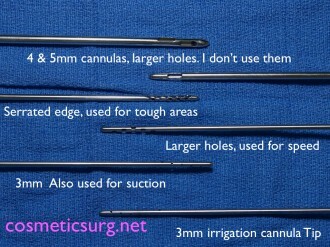 When a surgeon uses these large cannulas there is more bruising, pain, and lumpiness. The surgical result is not as good. The cannula at the bottom of this photo is narrower, and has a few very small holes. It was designed for putting fluid into the tissues, not suctioning fat. But it can be used for suctioning fat. It’s great because it can get really close to the skin without creating irregularities. I love it for finesse work. Using the small cannula takes more surgical time, but the results make it worthwhile. The other 3mm cannula shown in the photo (near the bottom of photo) has larger holes and a higher number of holes. It is used for more aggressive, faster liposuction. Because the holes are on one half of the cannula, by turning the holes away from the skin, it can be used very superficially. The serrated cannula is used for tough fibrous areas such as the upper back. Years ago I used ultrasound lipo for these tough areas, but the serrated tumescent cannula gives me better control, and I can work really close to the skin, which is not a great option with Vaser or Smart lipo. And that’s it! I can do the full range of lipo with just a few cannulas efficiently, with finesse, little bruising, and very little pain. Since I didn’t spend tens of thousands of dollars to buy rapidly outdated lipo machinery I can pass on the savings to you. More importantly, I can rest easy knowing you will have a great liposuction result. I can’t even remember the last time any of my liposuction patients needed a touch up. The tumescent method of liposuction with thin cannulas gets it right the first time. Dr. Kristensen, thanks for reading the blog. Thanky very much taking your time for a qualified response. I will definetely follow your advice closely, but initial with the Bodyjet I think I will use the 3,8mm deeper and the go smaller superficially. I prefer small cannulae because I can go as close to the skin and be as aggressive as i want. If you want a real life illustration of what you are leaving behind, do the following experiment. Take the panniculus that you were going to cut off anyways in an abdominoplasty and liposuction it as aggressively as you can with a 3mm cannula. Then open up the skin and take a look. The next time you do an abdominoplasty repeat with the 3.8mm cannula. See the difference. As far as tumescent, I infiltrate until the tissues feel hard- “tumor” or tumescence. I then wait a full 20-30 minutes until I start liposuction. Finally, I use a small hole cannula. In the beginning it feels like you are not getting anything accomplished, but after a while it starts coming out like puree, very fine. If I counts for anything, I don’t get serums, and I can’t remember the last time I did a revision. It comes out very smooth because you are leaving behind a very fine mesh of tissue. It is also very important to apply topifoam pads for five days and leave the compression garment on undisturbed for 5 days post op. When falling over you block I could not help notice that you are favoring the tumescent liposuction. I don’t use the Vaser system, but as far as I have seen they are using tumescent. With smartlipo tumescent and suctioning after going through with the laserfiber if larger areas. I use the Bodyjet, mostly 3,8mm cannula and it works for me, but I may try out more small cannulas after reading your reflections. But I am curious when you define tumescent and not so. I would not worry, many patients have done it and I haven’t heard any complaints. I also assume that somebody else will be helping you change your drains. You really should have somebody with you a few days after these procedures. Talk to Kelly or Vanessa at 410 494-8100 and tell them you have been corresponding with me through the blog. great! thank you again for such a quick response. I will be in touch with Kelly. just one thing. I wasn’t sure if you said that upper arm lipo can be combined with back lipo and tummy tuck. I am concerned that the arms might be sore and with any changing of the drains and post op needs might be difficult. With Tummy Tuck, the critical factor in healing time is the healing of the abdominal muscle. The additional procedures don’t really add to the recovery time. For cost information, contact Kelly at kelly@cosmeticsurg.net, she’d be happy to talk to you! I would like to have upper back and arm lipo done with my tummy tuck is this possible? If so does it add to the 2 – 3 week recovery time and is the cost individualized for each procedure? We do a lot of arm lipo. We do not do many arm lifts because of the scars. Only patients who have had massive weight loss benefit from it as they have no other good alternative and most don’t mind the scar. We don’t have it posted on the web, but we should, thanks for calling our attention to it! Update: We now have information available for the arm lift procedure. I checked everywhere on your website and couldn’t find lipo of the arms or arm lifts. do you perform these procedures as well? We are makers for Liposuction cannulas.Please let us know if you are interested in any of these. we can provide quality as per doctors requirement as we regularly making and exporting to many counties. We are interested to know your orders.